We all come in different shapes and sizes. Our differences are not limited to the physical space, but also extend to the behavioural space. What's good and right for one person, may not be for another. When psychologists define Personality, they tend to refer to the characteristic patterns of thoughts, feelings, and behaviour; and the psychological traits that lead to these patterns. These patterns are relatively permanent and provide consistency and individuality to a person’s conduct and social interaction. Any distinguishing behavioural characteristic, feature or a quality that defines an individual is a "trait". The combination and interaction of various traits forms a personality that is unique to each individual. Many psychologists have studied personality and have attempted to identify or define the different human characteristics. One of the most recent and influential theories is referred to as the "Big Five" theory. 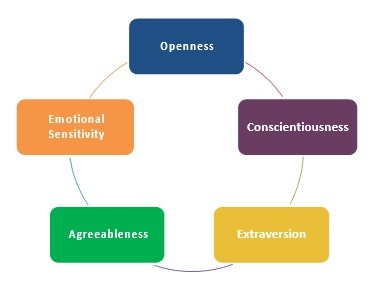 This Five Factor model of personality represents five core aspects that interact to form human personality. The PPA is based on this model of personality assessment. Openness to Experience is a general appreciation for new experiences and forms of art, emotions, adventure, unusual ideas, imagination, curiosity, and variety of experience. People who are open to experience are intellectually curious, appreciative of art, and sensitive to beauty. Conscientiousness is a tendency to show self-discipline, act dutifully, and aim for achievement against measures or beyond expectations. The trait shows a preference for planned rather than spontaneous behaviour. It influences the way in which we control, regulate, and direct our impulses. Extraversion is characterized by a tendency to seek out social stimulation and opportunities to engage with others. Extraverts are often described as being full of life, energy and positivity. In group situations, extraverts are likely to talk often and assert themselves. Agreeableness is a tendency to be compassionate and cooperative rather than suspicious and antagonistic towards others. Agreeable individuals value getting along with others. They have an optimistic view of human nature. They believe people are basically honest, decent, and trustworthy. Emotional Sensitivity is the tendency to experience negative emotions, such as anger, stress, or anxiety. Those who score high on Emotional Sensitivity may be emotionally reactive and vulnerable to stress. These problems in emotional regulation can diminish their ability to think clearly, make decisions, and cope effectively with stress.